The closing day program begins with a maiden claiming state-bred sprint that requires a spread in rolling exotic play. We’ll use three but not with any great conviction. #6 Runninto Grunions is a sneaky first-timer from the Peter Miller barn with a series of useful workouts at San Luis Rey Downs, including a bullet five furlong gate drill late last month. He won’t have to be a world beater to act with these. #4 Amazing Love closed a bit of a gap in his debut after a slow start and seems certain to improve. The switch to Flavien Prat is a significant sign for the Steve Miyadi barn. #3 Downside Up, a fair fourth in his debut vs. straight maiden foes, should produce a forward move with that effort behind him combined with this drop into softer company. The second race is a starter’s allowance sprint that brings back the recent highly-rated maiden claiming winner #4 Rizzi’s Honors. She left her previous form behind with a confidence-building tally last month when dropped into a seller for the first time, and if she can turn in two alike she’ll be hard to deny right back. #7 Brookes All Mine flunked her route test at this level last time out but a repeat of her maiden claiming score two runs back puts her in the thick of things. She’ll most likely enjoy a comfortable pace-stalking trip outside and seems like a logical exacta partner with ‘Honors. We’ll use both in our rolling exotics and then press with Rizzi’s Honors on top. State-bred first condition allowance fillies and mares sprint six and one-half furlongs in the third race. #1 Dis Smart Cat lost a toughie when stretching out to a mile last time out as the odds-on favorite but earned a career top speed figure in the process. She’s back around one corner today, has trained well since her last outing, retains Tyler Baze, and will be tough to deny if she can avoid trouble from the rail. #3 Tuscany Beauty, also a beaten choice at odds-on in her last start, will add blinkers today and should be part of the pace throughout. She’s slower on speed figures than her chief rival but has room to improve and should be included in rolling exotic play as at least a saver or a back-up. The fourth race kicks off the Pick-6 – its closing day so there’s a mandatory payoff – there’s a carryover from yesterday of $75,126 to boot. This soft maiden claimer looks treacherous but we’ll try to survive using just two. #1 Legitimate is a nine-race maiden but is dropping to his lowest level ever and has numbers that are good enough to beat this field. His rail post does him no favors but with a clean trip he should be right there. #6 Aidan’s Hope finished second in his last pair, most recently at 3/5 in a similar affair last month. Despite being from a low percentage outfit, he’s a major player by default. The fifth race is a five furlong starter’s allowance dash that appears made to order for #3 Flexible Ethics and #4 Audra, and both should be used in rolling exotic play. Flexible Ethics likes this track (two wins in four starts) and a repeat of her last race – a solid third place effort over this track and distance – might be good enough. Audra just won a restricted (nw-3) $16,000 claimer in fine style with a career top speed figures and if she doesn’t bounce off that effort – and she’s had a month off to insure that she won’t – the Jack Carava-trained filly will be the one to beat. The sixth race is a loaded 2-year-old maiden special weight sprint with several well-regarded entrants. #2 Ky. Colonel has done everything asked in the a.m. for trainer Richard Mandella and seems plenty fit and ready for a major effort first crack out of the box. Prat has been on him in the a.m. a few times and really hasn’t asked this son of Into Mischief for anything close to his best. We’ll put him on top but spread the race. #1 Klimt has the benefit of an outing and should produce a forward move, though the rail is a concern. The son of Quality Road exits a live race and figures to be running on strongly late. #3 Aqua Frio was as strong runner-up in his only outing and is another likely to produce a forward move, while #8 Excavation is a first-timer from the Phil D’Amato stable with a good work tab that should have him plenty fit. The seventh race is a Cal-bred maiden special weight sprint that appears stronger than par for the level. #9 Candy Promises was nosed out in a similar event last month while earning a career top speed figure; if he doesn’t regress today he’ll be hard to handle, especially from his favorable outside draw. #6 Lovely Anzi was more than nine lengths clear of the rest when second in a fast state-bred abbreviated dash a month ago; he’s probably the quickest in the field and could be hard to catch if not pressured early. #4 Pee Wee Reese didn’t run to his works in his debut last December and was stopped on; the D’Amato-trained son of Tribal Rule has worked well for his comeback and most likely is much better than his debut shows. Let’s give the edge on top to Candy Promises but use all three in rolling exotic play. #1 Tribal Fighter looked good breaking his maiden in his second career start in mid-March and finally makes it back in today’s eighth race, a five furlong entry-level allowance sprint for California-breds. He’s a first-time gelding for trainer Richard Baltas, retains Rafael Bejarano, and will be tough to beat if he breaks cleanly from the rail. #4 Boy Howdy won at first asking in early May and returns two months later for trainer Bill Spawr sporting a very healthy work pattern in recent weeks. He’s considerably slower on speed figures than Tribal Fighter but most likely has plenty of improvement in him. We’ll double the race in our rolling exotics and then press on top keying Tribal Fighter. 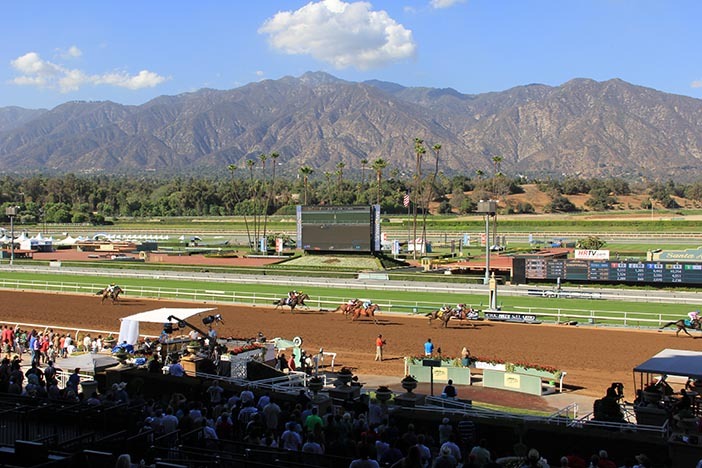 The finale is a tough first-level allowance sprint at five and one-half furlongs. #4 Rocket Fuel ran below his best form when beaten as the choice in his most recent outing; however, the winner of that race, the blazing 3-year-old Drefong, came back to win on the raise and it’s not likely there’s anybody that good in here. The Bruce Headley-trained gelding will race with blinkers today, and following a 58 4/5 seconds bullet workout last week should snap back to his best. #3 Power Jam, away since November but burning up the track for trainer Bob Baffert, won his debut impressively so you know he can fire fresh, and on pure numbers he’s fast enough to beat this field. Let’s use both in our rolling exotics while giving a very slight edge on top to Rocket Fuel.